Summary for the Busy Executive: Fun. 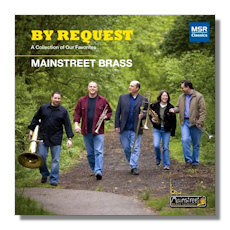 I love music for brass quintet, so this CD pretty much had me before I put it on the Discman. On the other hand, I don't particularly care for crossover junk. The Canadian Brass Quintet, as fine as they are, regularly annoy me with their attempts to "reach out." I can't shake the feeling that they patronize both what they present and those they present it to. I suppose it all comes down to the quality of the arrangements. The Mainstreet boys have a few clunkers on the program, but they ring the bell quite a bit of the time. Over the years, my favorite brass groups have included the Philip Jones Brass Ensemble, the Empire, and the Millar Brass. I have heard only this album by the Mainstreet, so I have no idea of their range. But I do like their sense of repertory enterprise and, for the most part, their taste. I could have done without the Japanese medley, but I might just as well blame myself. Like most people who don't know a music very well, "it all sounds alike to me." The cover lists eight songs in the medley. I got five. Lee Holdridge's An American Hymn comes from the TV mini-series East of Eden – a score which takes a severe toll on my pancreas. I love Ellington's "It Don't Mean a Thing," but the arrangement, compared to Ellington's own chart, is pretty corny. The same goes for "Moonlight in Vermont." On the other hand, it took some inspiration to choose Morton's Dead Man Blues, and the arrangement (admittedly, a little stiff) shows it off well and respects the composer's New Orleans origins. "Darktown Strutters' Ball" absolutely delights, with a nifty 3-part contrapuntal section toward the end, paying fanciful homage to the Chicago jazz jam. I loved the Rimsky, a favorite of mine for many decades. Necessarily, the arrangement loses some of the colors of the orchestral original, but it shows the strong skeleton of the score. The Mainstreet play with spirit, a good sense of humor, and poetry where needed. The jokes are never jokey. To me, the really exacting piece, David Marlatt's arrangement of the Queen of the Night's killer aria, shows the ensemble's chops, particularly those of the two trumpeters, Kevin Long and Donald Hughes. However, this isn't really a matter of a star and his backup group, but of a true ensemble. Mainstreet also has a Christmas album, but I'd really like to hear them in something a bit more ambitious. Nevertheless, this album is its own good time.